I lead the life of a digital nomad. I have a MacBook, and iPhone and iPad. To coin a phrase: I don’t need to access all of my data all of the time, but I do need to access some of my data all of the time. 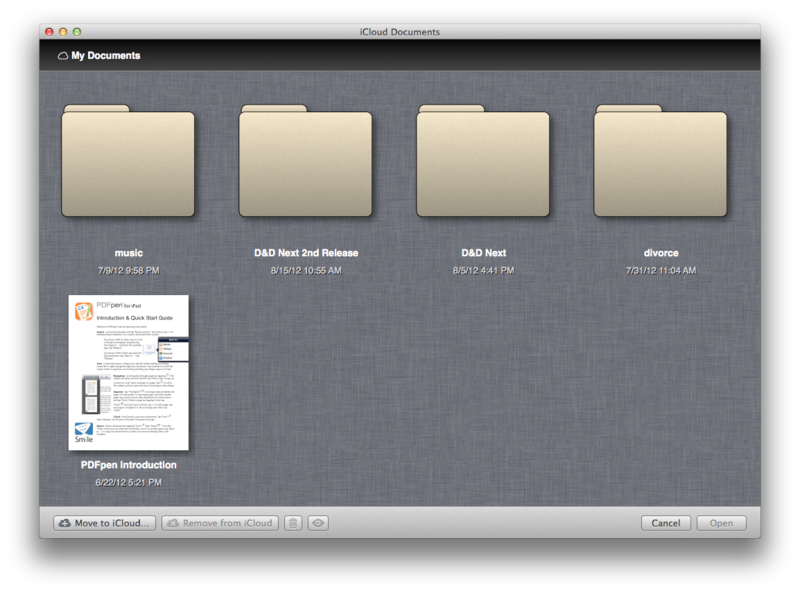 Central to this is Apple’s(s AAPL) Documents in the Cloud feature, which is much improved in Mountain Lion. Basically, applications can store files in their own sandbox in iCloud, and OS X and iOS versions of the app can access (and change) the files. This means you can have a central repository for files. There were three main goals to moving most of my data into Documents in the Cloud: ease of finding it, and ease of recovery if my hard drive fails; and the ability to work on a file on both my iPad and MacBook. A secondary goal is to have my research materials, notes, calendar and reading material available across my devices. It’s also important to note that the type of work I do on these devices is very portable. For the most part, I deal in text files that are easy to fling between devices. These are also the files I need access to for editing on the iPad. It’s not uncommon for me to do some writing when all I have is my iPad. That said, my corporate job is very Windows-centric, and our security policy is very anti-Cloud. So, it’s easy for me to define realistic goals for cloud computing and find tools that work for me. In this case, “work” for me defines my writing business; not my day job. That said, depending on your job, you might be able to integrate some of my findings in your work life. As I mentioned, my main activity on my MacBook is writing. The one requirement I have for an editor is it has to work with Documents in the Cloud and have an iOS partner. 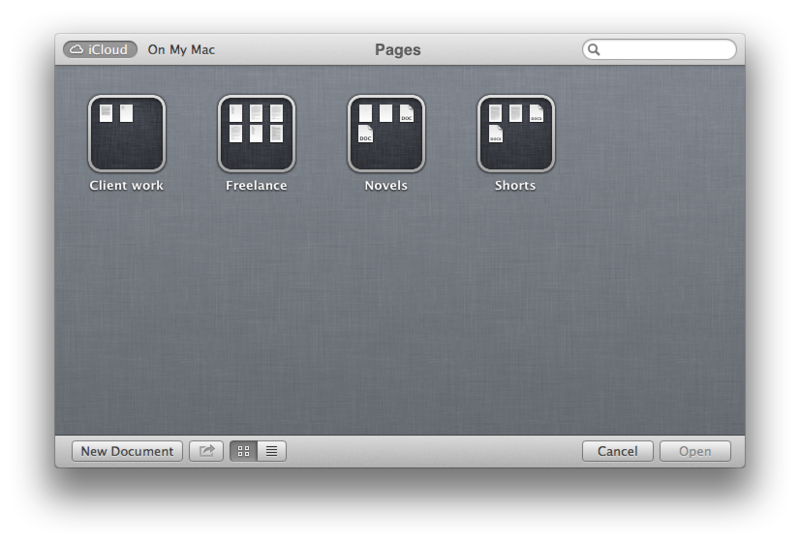 I’ve been floating between Pages ($19.99 Mac/$9.99 iOS) and Byword ($4.99 Mac/$2.99 iOS), but have settled on Pages. While overall I liked the interface better on Byword (especially on the iPhone), I’ve found it’s slightly fewer taps to send a file from Pages. As you’d expect from the thesis of this post, I solely use the cloud storage options in Pages (and, while not used as often, the rest of the iWork suite). There are three main reasons I use Documents in the Cloud: ease of finding files; the ability to access files on both OS X and iOS; and quickly get up and running on a new piece of gear. I’ve accumulated a ton of files over the years. Some of them are half-finished projects. Some are archived old writings. I’m at the point where remembering where I put a new file, and drilling down to get it, was becoming a bother. I set up Smart Folders to find Pages documents, came up with different folder naming schemes, but, in the end, the simple fact remained: I hated the Finder. So, I declared writing bankruptcy and started saving all my iWork documents in the cloud. This had the secondary bonus of letting me edit files on my iPad. The iPad has become my primary mobile device. Fortunately, the work I do doesn’t really require the full might and power of my MacBook Pro. I’ve got an Incase Origami that I throw in my “it’s a satchel, Indiana Jones had one” bag if I need to work on something hefty. The main advantages to this setup are that I can quickly send a copy of a file to someone on a moment’s notice, and I can write wherever I am. So far, I haven’t really experienced any major downsides. Once, the iPad was having trouble downloading the latest versions of a file, but restarting iCloud fixed that. As an aside, while it doesn’t have an iOS equivalent, I’ve been using the Documents in the Cloud feature of Pixelmator ($14.99) to easily find my graphics files and to access from a second Mac if necessary. The second major Documents in the Cloud feature I use often is storing PDFs. For that I use PDFPen for Mac ($59) and iOS. I don’t have to edit or markup PDFs, but I do need access to my library of PDFs. All the legal documents from my divorce are stored in PDFPen, as well as author agreements to publishers, the documents to a pen-and-paper game I’m beta testing, some photography magazines that are in PDF form, and a standard model release. I haven’t run into too many problems. Every now and then PDFPen for iOS gets a little fussy on large files, but the increased memory of the new iPad has reduced the frequency of that. Being able to quickly look something up in my divorce agreement when my ex-wife called with a question was a win for the system. An iOS version of Preview is one area I’m very surprised isn’t available yet. Maybe it’ll be a feature announced next week, but I’m not holding my breath. The biggest concern I have is backups. Unlike Dropbox, I can’t go back in time and restore a deleted file. If you delete something from Documents in the Cloud, it’s gone. The good news is, if you are running Time Machine, your ~\Library\Mobile Documents folder is backed up as part of Time Machine. You will need to enable the Finder to show hidden files to easily see them in Time Machine. If the file only resides in iOS and it’s deleted, it’s pretty much toast. Periodically, I’ll copy the entire Mobile Documents folder to a second drive just to have a secondary backup. Mat Honan’s epic hack was a good wakeup call about the pitfalls of a digital lifestyle. It’s important to remember that anything you have stored in the cloud could end up being accessed without your blessing. Hacks happen. Therefore, it’s important that any information that you consider to be sensitive, or would be embarrassing if shown to the world, never, ever, get stored in the cloud. If your work prohibits files being stored in the cloud, don’t try and work around it and store them up there anyway. Does anyone know how to get OLD pdf’s into PAGES for Iphone? I didn’t realize when I got PAGES, that it will let you create PDF’s, but won’t let you upload old pdf docs. And I use a PC, not a MAC. iCloud is a nice start, but its far from a robust solution. Google does more and offers more with GDrive. As others have mentioned I need/want/require the ability to sort and categorize my data into folders like Drop Box (I dropped them after their TOS changed). I am willing to pay for the extra storage but I need a more robust features for Apple. iCloud should not be another “hobby” device like AppleTV is for them, this is supposed to be a central hub for all of our on the go critical data, contacts, calendar, notes, email, (find my iDevice). Unless Pages for iOS has been seriously updated to support landscape (it didn’t the last time I looked a while back) its just not worth it. I do own iWork but it also has not been getting updated from Apple. @gregoryventana – thanks for the info on GoSecure it looks promising and I will give that a trial run. Really good read! Especially since I just purchase my new MacBook Pro today and will be learning the iCloud on it when I receive it next week. Sorry, got to have a folder/subfolder system that organizes my files (pages, numbers, PDFs, word, photoshop, illustrator, etc.) in the most logically related folder formats. Just like dropbox. Any sensitive data, whether it is stored locally or “in the cloud” should be encrypted. Hacks such as the Mat Honan incident are rare, but computer theft is very common. I use GoSecure ($19.99) because it makes it very easy to encrypt individual files and folders. Transferring files to another computer is no problem as long as GoSecure is installed on it. GoSecure offers 128 and 256-bit AES options. Knox is another popular encryption program that is similar to GoSecure, but it costs twice as much.